When you live in the country, you can't take anything for granted. Having water flow every time you open a faucet is not necessarily a sure thing. New building codes for our area require that our new house has a fire sprinkler system and a 10,000 gallon water tank to store water. The rural fire district also requires that this tank be available to fill fire trucks in the event of wildfires. 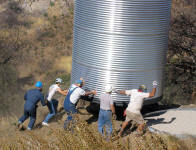 In 2005 our water tank cost $6,000 with an additional $2,000 to have it lifted to its final resting spot. The following is the story of that experience. 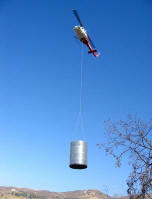 The helicopter finally came on Saturday and carried our water tank to its final resting spot. This was a project that had been a year in the making and finally came off, with a few hitches. The first job, and first problem, was getting the gravel dumped. It weighed over a thousand pounds and was lifted in a sack that developed a tear in the bottom after it was picked up. We had to stand under the thing while, from a high altitude, �� gravel rained on our heads. The gravel pelted us with enough force to take chips out of our hard hats. When the copter finally got the bag close, the prop-wash started it swinging and it ripped out the steel ring that was supposed to contain the gravel. A thousand pound pi�ata gone wild. The pilot finally gave up and set the bag down outside the ring and we had to shovel the gravel in by hand. We had just enough time to level the gravel while the copter went back to pick up the tank. The tank drop went similarly. The wind from the prop started the tank swinging and it took over ten minutes to get it centered over the gravel. During that time the tank was swinging every which way, bashing into boulders and trees. When the pilot would finally get it close to the ring, five people on the ground would try to align it, only to have it catch in the wind and swing out of reach. Eventually the job got done though the tank suffered dents and scratches. Hopefully nothing too serious though we won�t know for sure till I run a pipe up the hill and fill it with water. For now, we owe a huge debt to our neighbors. The job turned out to be more dangerous than anyone expected and we�re lucky that no one was hurt.